What is Brand Strategy Discovery? A core element that many miss. What is Brand Strategy Discovery? A core element that many miss. 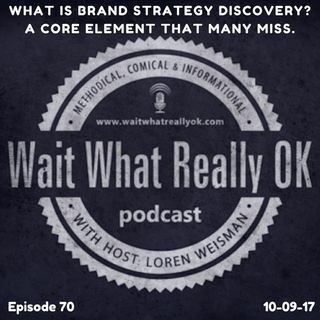 Wait What Really OK Podcast Episode 70 hosted by Brand Precision Marketing Strategist and Counselor Loren Weisman, goes in on the idea of the discovery phase of branding. Are you looking into the comparisons and those that run close to your brand and your concepts when you are creating your brand? Take the time to do the discovery as you create the blueprint for your brand. Look at what others are doing and how you can ... Más informaciones differentiate yourself while still applying your voice, your style and your image to the brand that you are creating. What is Brand Strategy Discover? Simply put, it is the phase between the wording, phrases and initial development of your brand being searched against other brands to allow you to see what can work for you and what can work against you as you also find ways to expand your message with an individualized touch that won’t get caught up and mistaken for others. Ep 70 “What is Brand Strategy Discovery? A core element that many miss.” of the Wait What Really OK Podcast is available on iHeartRadio. Podcast Blog Supplement for Episode 70 of the Wait What Really OK Podcast with Loren Weisman. Podcast Link Supplement for Episode 70 of the Wait What Really OK Podcast with Loren Weisman. Have you discovered someone else is trying to be you on Facebook? Podcast Video Supplement for Episode 70 of the Wait What Really OK Podcast with Loren Weisman. Podcast Photo Supplement for Episode 70 of the Wait What Really OK Podcast with Loren Weisman.